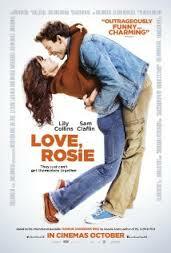 Love, Rosie is one of those films that I saw the trailer and instantly wanted to watch it. Not only being a fan of Lily Collins since watching The Mortal Instrument, but being a mega fan of any cheesy, romantic comedy. Love, Rosie had everything going for it. Let me tell you I've never laughed so much. Lily and Sam (her co-star) have the most amazing chemistry, with half of them not even acting making the film. It was based along ten or twelve years, which showed Rosie's (Lily) daughter grow considerably and Rosie age very well. Not going to lie, the film was so predictable - and that's without me reading the book - and though I was happy it went the way it did because I'm a sucker for a good romance, I'd of liked to have seen more of the romance. When the romance came, it kinda, sort of ended on a disappointing note. The humour way amazing, laugh out loud funny.